Our next Barefoot Cabin analogy came when Tom and I were told by our rental agency that we should provide an alarm clock in every bedroom. I can’t remember the last time we actually bought one, so we headed to Walmart hoping not to spend too much of our dwindling budget on these time machines. We figured most people use their cell phones as an alarm anyway, right? They had no electrical cord, which means the battery power would be used all the time, making this “cheap alarm clock” expensive in the long run. They had no brightness adjustment, so sleeping with it on the nightstand was like sleeping with a flashlight in your face. Cheaper is not necessarily better. You get what you pay for! What does this have to do with marriage? The answer hit me first thing this morning! We can treat our marriage like we did these alarm clocks. We knew we needed them, but we weren’t willing to invest the money for a good one. It’s important to stay plugged in to each other and The Lord. Self-sufficiency won’t work because marriage has a way of breaking down our own strength. If we are relying solely on our own ability to have a good marriage, it won’t be long until that battery is completely spent. It’s not obvious at first, but slowly over time you begin to neglect doing the things you did at first, like date nights, long conversations, acts of kindness, etc. We can waste our time on things that don’t matter, and neglect those things that do. This is why we shouldn’t be surprised if our marriage isn’t what we’d hoped it would be a few years down the road. If you haven’t made your time together a priority, your marriage will be affected. Sadly, some couples don’t realize this until their kids grow up and move on with their own lives. It’s in this transition that many couples call it quits! They think the marriage is no longer working, like a worn-out clock. Today we’ll be taking these cheap alarm clocks back to Walmart and hope to find ones that are gentler and kinder with a built-in electrical cord. 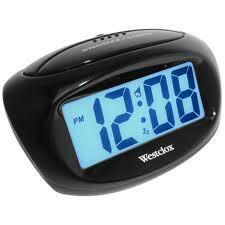 Next time your alarm clock goes off telling you it’s time to wake-up, let it also remind you to check your marriage. The best way to know how well it’s going is to ask your spouse. This entry was posted in Christian Marriage, communication, Dating Your Spouse, Growing Strong Marriages, Priorities and tagged Alarm clock, Barefoot Cabin, Clock, God, Lord, marriage, Priorities in Marriage, Shopping, Walmart. Bookmark the permalink. Glad that alarm bell rang for you before it was too late! 🙂 the smell of coffee does wonders! So many people sleep through their alarm in marriage. They had planned to be proactive, but then when the time came, they hit the snooze button until it’s suddenly an emergency and everyone is scrambling about yelling at each other about why the other spouse didn’t wake them up. Just because the snooze button is there, doesn’t mean you didn’t need to wake up for a reason.